Holiness & Brothers E.M.S Inc. is a locally owned and privately operated non-emergency medical transportation agency located in Houston, Texas. We are available 24 hours a day, 7 days a week, including holidays. We provide our transportation services to the elderly, the injured, the disabled and many more. 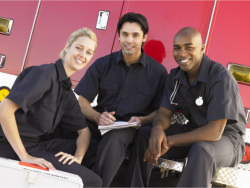 We are certified Basic Life Support (BLS), Advanced Life Support (ALS) and Mobile Intensive Care Unit (MICU) Transportation Provider and we serve the cities and counties all over Houston. When you call Holiness & Brothers E.M.S Inc., you will be answered by an experienced and trained dispatcher who will answer your concerns, inquiries and questions in a friendly and efficient manner. Allow us to assist you in fulfilling your needs so we can provide you with the appropriate level of medical and transportation care. Holiness & Brothers E.M.S Inc. is a professional and compassionate team of professionals who has your best interest at heart. We are determined to provide you with only superior client care coupled with an outstanding customer service. When you travel with us, know that you have our undivided attention. All of our staff have undergone a strict pre-employment process to ensure your protection. This includes: comprehensive personal and criminal background checks, drug testing, reference validation, and many more.